This study evaluates commercial farmers' views of their role as mentors in the land reform programme in two regions of the Free State Province. It reveals that the majority of commercial farmers in the study area are willing to act as mentors. The farmers overwhelmingly agreed that their role as mentors is very important. On average, the farmers were willing to participate in the mentorship programme and most of them expect to receive remuneration for their work as mentors. A little over two thirds of the farmers believe that the extension services play a vital role in the development of emerging farmers, while others indicated that they were not satisfied with the current advisory service. The study recommends that before any agreement is entered into with any mentor a guide should be developed to ensure that priority areas are taken care of in order to avoid conflict at a later stage. Since the dawn of democracy in South Africa, a number of transformational policies have been developed. Of particular interest in this study is the land reform programme, initiated by the Department of Land Affairs which changed its name to the Department of Rural Development and Land Reform. Land reform programmes were implemented in all nine provinces of South Africa. As a result, this study focuses on two regions in the Free State. The implementation of land reform in South Africa in general, and in the Free State in particular, may be seen as contributing towards food security (Ministry of Agriculture and Land Affairs, 2000). However, this was not realised on a large scale due to different challenges that beset land reform in different areas of operation. To make recommendations based on the findings of the study. Studies have revealed that mentorship, as a concept, faces a number of challenges with regard to its interpretation as well as its implementation. Many researchers, such as Terblanché (2003), Terblanché (2007) and Lonsdale (2008), have made their contributions in this regard. Some people equate the term 'mentoring' with 'coaching'. Others, however, disagree with this interpretation. Since the focus of the study is on mentorship, there is a need to clarify the concept. According to Terblanché (2007), mentorship can be described as a nurturing process in which a more skilled or more experienced person serves as a role model, teaching, sponsoring, encouraging, counselling and befriending a less experienced person for the purpose of promoting the latter's professional and personal development. When it comes to implementation, few challenges are highlighted; some government structures were suspicious of mentorship since it was simply a tool of extension, and the intentions of those who proposed mentorship as an extension tool to assist South Africa's poorly performing land reform programme, were misunderstood (Jordaan & Jooste 2003). Other negative aspects of mentorship may result from a number of factors such as incompatibility in terms of style in the relationship between the mentee and the mentor (Lonsdale ,2008); working within unrealistic timeframes and expecting too much from the mentee; the mentee having a hidden agenda; a mentee with an inappropriate attitude and who expects too much from the mentor; mentees demanding more time than they actually need; peer jealousy (in cases where colleagues do not have a mentor); and professional jealousy (in cases where one mentee demands and gets more attention than others) (Terblanché ,2007). The implementation of a mentorship programme in land reform projects is a necessity (Kiewiet, 2001). Reasons include the farming skills possessed by the mentor such as the timing of agricultural operations and teaching new farmers how to plan and to take decisions in running their enterprises (Lonsdale, 2008). The availability of a mentorship programme does not automatically ensure its success. Of critical importance is the skill of the mentors, which they ought to have. There is also a need for careful planning and the inclusion of monitoring aspects in the mentorship relationship, such as clearly defining the role of the mentor. In this case, the mentor should not be seen as a teacher, trainer or boss, but rather as one who nurtures a relationship of mutual trust and openness (Kiewiet, 2001). Lessons learnt from successful mentorship, for example, in equity shares schemes, were found to possess the following common features: external audits; annual general meetings; disclosure of financial statements; formal procedures for conflict resolution; tradable benefits and voting rights assigned in proportion to individual investment (Gray, Lyne & Ferrer, 2005). The study was conducted in two separate areas. The first study is characterized by semi-arid conditions with an annual rainfall of approximately 700 mm. It is a summer rainfall region with occasional hail, frost and snow. It consists of mixed farming areas which include wheat, maize, sunflower and livestock production. The towns in this study area are Ficksburg, Rosendal and Senekal, all of which are situated in the eastern part of the Free State, whereas the second study area is also a summer rainfall region with the rainfall ranging between 300 mm and 500 mm per annum. The towns surveyed include Wepener, Van Stadensrus and Smithfield. This is predominantly a livestock production area because of the grassland. As far as the sample is concerned, it consisted of 60 commercial farmers in the two study areas. The following instruments were used to collect data: a structured questionnaire, unstructured interviews and key informant interviews. Data analyses were performed, using Statistical Analysis Systems and direct calculations. This paper reports on the perceptions of commercial farmers with regard to mentorship. Ownership in farming, especially in a communal setting, is dependent on the number of beneficiaries that participate in the project (Zwane, 2012), unlike in the commercial sector. Table 1 depicts the situation of farm ownership. 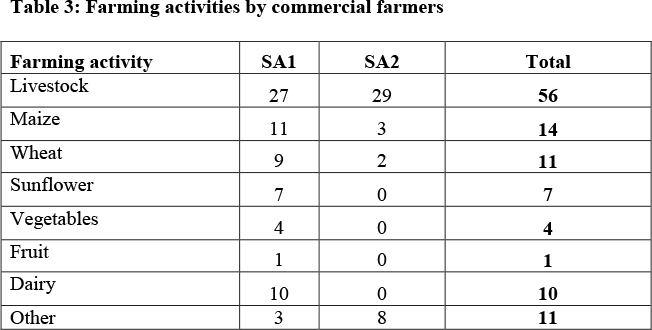 Table 1 show that more than two thirds of the commercial farmers farmed on their own land (60% for Study Area 1 (SA1) and 70% for Study Area 2 (SA2), thus 65% of the combined total). It is important to note that there is usually only one commercial farmer per farm. In their opinion, land reform should also have the purpose of establishing one emerging commercial farmer per farm. This study is concerned with mentorship in commercial farming rather than communal farming. Farm size and the availability of farming infrastructure both play a significant role in farming. For example, farm sizes differed considerably between the two study areas as indicated in figure 1. A total of 60% of the farms in Study Area 1 ranged between 100 and 500 hectares, while 70% of the farms in Study Area 2 were 501 hectares or larger. The implication of the farm size is that it can influence the extent to which a commercial farmer can act as a mentor to the emerging farmer because of the distance between them. When farms are smaller, as in Study Area 1, farmers are able to visit their neighbours more easily. Linked to farm size is the availability of infrastructure on the farm. Most of the farms in the two study areas have an established infrastructure of fencing and water. This means that the emerging farmer does not have to spend a vast amount of money on these infrastructures. The implication for mentorship, based on the infrastructure, is as follows: farms occupied and farmed by emerging farmers are usually farms previously owned by commercial farmers. The challenge for the emerging farmer is to maintain and expand the infrastructure established by the previous owner. It would be of great value if the previous owner could provide the emerging farmer with advice. Certain infrastructures, for example, water pumps and pipelining, are more complex to understand and the knowledge should be transferred from one owner to the next. Terblanché (2007) and Hooglander (2005) have voiced the need for the mentorship of new farmers, especially by the land reform programme. Newcomers to farming cannot be expected to succeed without experience. This study has revealed that commercial farmers in the study areas have farming experience, which ranges from one to 67 years. The average period of farming experience in both study areas is 21 years. Commercial farmers have become experts in the field of farming. For example, they possess technical knowledge in terms of production and the handling of farming equipment. In addition, they understand the way in which farming is influenced by other elements such as weather, markets and marketing trends. It is this experience in farming which makes commercial farmers ideal mentors. The Food and Agriculture Organisation (FAO) defines agricultural extension as a service or system, which assists farm people, through educational procedures, in improving farming methods and techniques, increasing production efficiency and income, improving their standard of living, and increasing the social and educational standards of rural life (Swanson & Claar, 1984). Training is one of the most essential skills of farming, ** which implies an assumption that the beneficiaries either already possess such skills or that they will acquire the necessary training themselves. Such training needs are sure to be extensive. 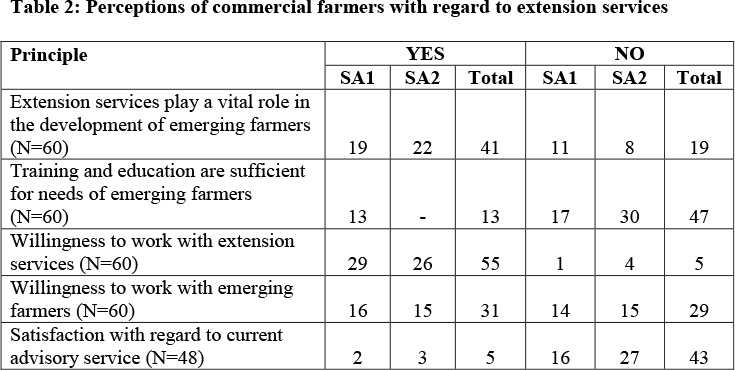 The perceptions of commercial farmers with regard to extension are reflected in table 2. Table 2 shows a somewhat positive attitude in general (with a few negative responses) to what is perceived to be inefficient areas within extension. Interestingly, a sharp contrast exists between the two study areas when asked to indicate whether the training and education provided to emerging farmers were sufficient to meet their needs. While Study Area 1 was almost evenly divided between agreement and disagreement (with a slightly stronger [57%] disagreement), not a single farmer in Study Area 2 felt that this was the case. It is encouraging to note that the majority of the farmers are willing to work with extension services and that they view extension as playing a definite role in the development of emerging farmers. Zimmerman (2000) confirms that farming demands a basic understanding of bookkeeping, pesticide application, fertilizer demands, planting and replanting periods, crop associations and rotations, as well as risk management. Emerging farmers are usually familiar with livestock farming; therefore strong emphasis should be placed on livestock during the land reform process. Commercial farmers tend to be involved in different farming activities rather than in a single enterprise as represented in Table 3. According to the study the majority of the commercial farmers in Table 3 are involved in livestock activities. With the establishment of emerging farmers, it is necessary to build a strong livestock foundation as far as farming operations are concerned. Commercial farmers consider livestock to be a steady factor on their farms. The risks associated with livestock are fewer than with crop farming and this could ensure success in the early years. According to Allwood (2008), the success of mentorship depends on the personal relationship between the person with the knowledge and the person receiving it. The latter should look up to the mentor as a true leader and should feel comfortable in his/her presence. It is important to distinguish between a mentor and someone acting as an advisor. Emerging farmers need an advisor to set an example. The advisor may be appointed as a formal mentor at a later stage. The results of the study are indicated in Table 4. From Table 4, it is apparent that very few of the farmers had been involved in the mentoring process. To date, only 18.3% (N=11) of the 60 farmers had ever been involved as mentors. Of the 11 farmers who had been involved as mentors, two did not indicate for how long they had been mentors, three had been mentors for less than a year, two had been mentors for between one and two years, and four had been mentors for more than two years. According to Terblanché (2011) it takes a mentor and a new farmer at least a year to form a mentorship relationship. The importance of mentorship as well as the purpose of mentors has been identified in the literature. Mentorship is to coordinate training, manage, administrate, market and to be responsible for the overall empowerment of beneficiaries to enable them to run the business after three years. The results of the study are reflected in Figure 2 below. The fundamental aim of change within the business and personal environments of every person is to give increased meaning and quality to life and to make the working environment, lifestyle and surroundings more acceptable in the long term. The picture expressed in Figure 2 is very positive. For example, in both study areas, farmers overwhelmingly agreed that the value of a mentor is very important. Commercial farmers who participated in this investigation realize the importance of their roles as mentors and argued that they can assure that their area can become a sustainable environment for the future. According to Zimmerman (2000), land reform has two legs. On the one hand, it aims to alleviate poverty in rural communities, while on the other, it aims to successfully establish black farmers as commercial farmers. The responses of commercial farmers are indicated in Figure 3. The findings indicate in general that commercial farmers provided a variety of responses; although more than half of the farmers were willing that the mentorship included all three areas, namely technical, financial and administrative skills. Given the fact that the farming communities in the two study areas are dependent on climate and natural resources, it is important that the correct farming methods be utilized to ensure sustainable food production. A case study by Frost, Campbell, Luckert, Mutamba, Mandondo, & Kozanayi, (2007) in Zimbabwe was conducted to reduce the risks associated with dry land cultivation and has shown that it is necessary to introduce farmers to a wide variety of methods to improve the quality of the land. The case study made use of farmer-to-farmer visits which have proven to be successful because farmers demonstrated their innovations and farming methods to other farmers. This is an indication that the mentorship role of one farmer to another is also encouraged in other African countries. This approach can be adopted in South Africa as well. Terblanché (2003) is of the opinion that mentorship should be a life-long process which is a new challenge for extension workers, and that it should include an exchange of knowledge, skills and experience, as well as an acceptance of mutual responsibilities, while not being prescriptive. However, there was no mention of remuneration in the forgoing discussion. The opinions of the respondents appear in Table 5 below. The findings show that most of the farmers (47 out of 60) did expect to receive remuneration for their work as mentors. On average, they were willing to dedicate at least half of a working day per week for mentoring, with only one farmer willing to devote the equivalent of an entire week's work (one week per month). Notably, only ten farmers were willing to act as mentors without remuneration. Identification of priority areas in which mentors should possess capabilities. For example, some of the priority areas found in Study Area 2 include: (1) knowledge of a specific discipline; (2) availability; (3) honesty; and (4) listening to the problems of emerging farmers. Anyone who disregards the above mentioned priority areas will not be capable to assist emerging farmers optimally. In their capacity as mentors, commercial farmers, together with the government, should assist in increasing the productivity of emerging farmers. This can be achieved through the investment of resources in areas such as electricity, water and communication. One of the goals of mentoring emerging farmers is to improve farm productivity, thereby alleviating poverty. The study has tested some of the most critical areas of mentorship and a brief finding and its implication for each aspect have been discussed. Furthermore, it can be indicated that some of the main areas of concern have been pointed out, which will need to be attended to for the sake of improvement. Examples include the fact that the extension service is not satisfactory and that training and education are not sufficient to meet the needs of emerging farmers. It is encouraging that some of the findings are positive, such as the willingness of commercial farmers to work with emerging farmers as well as extension services. Efforts will need to be made to correct the negative perceptions of commercial farmers.